Summary: The Lord Jesus will come in the clouds of heaven. He will be crowned King of the world and his kingdom will last forever. Several years ago I saw a hot-air balloon race. 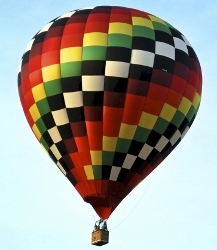 (Show picture of hot air balloon.) It looked like this. The sky was filled with large balloons that were filled with hot air to make them rise up into the sky. The riders were in baskets beneath them. The balloons were decorated with bright colors. It was amazing to see so many balloons gathered in one place. The balloons glided slowly in the sky like clouds drifting in the wind. Daniel described God’s throne in heaven. The Father is called the “Ancient of Days” because he has lived forever. The “Son of man” is Jesus and he came “with the clouds of heaven.” Jesus is crowned as King of the world. His kingdom will last forever. On two occasions Jesus identified himself as the person that Daniel spoke about. Children, one day the Lord Jesus will return to earth. The King is coming! So the next time you look up in the sky and see a lot of clouds, remember that the Lord Jesus is coming soon with the clouds of heaven. ©2006 by Jim Kerlin. All rights reserved.